Sequential Sunday: Jason’s Hey Wait…. One of the amazing things about how the mind works while reading comics is that we are essentially experiencing what is called a jump-cut between every panel, yet we still have a completely fluid storytelling experience. Our brain automatically fills in that blank space between panels. This is very similar to watching a movie where every edit goes from one image to another in a fraction of a second. It should be jarring, but somehow it isn’t. The difference between comics and movies in this regard is that reading is a much more internal experience. That we are the ones filling in those blanks spaces seems to make it more profound. A comic artist at the peak of his abilities can use this phenomenon to have an emotionally shattering effect on the reader- someone like Jason. “Hey, Wait…” tells the story of Jon and Bjorn, two young boys spending their carefree summer days as many kids do: playing ball, telling jokes, reading comics, eating candy, and talking about what they want to be when they grow up. This calm, contented existent is shattered forever when a playful dare leads to Bjorn’s tragic accidental death. The emotional aftermath of the event has a lifelong effect on Jon causing guilt and remorse that he can never shake. The pages of the book are laid out in a straightforward, six panel per page grid, yet the emotional dynamics and sense of pacing Jason accomplishes with this layout is often astounding to behold. In one particularly amazing feat Jon ages from child to adult in two consecutive panels that take place within the same scene. It is very important to note that the scene in question is Bjorn’s funeral. Sometimes the most impact in “Hey, Wait…” is conjured from not what is shown to the reader, but in what is happening between the panels, in the spaces and jump-cuts we fill in with our minds. The actual accident is not entirely seen, cut short at the split second before happening, yet a series of wordless panels showing the dead boy’s room with toys that will never again be played with and a superhero drawing that will never be finished, carry far more impact than any graphic representation of death could ever have. In another scene the lonely adult Jon brings a woman from a bar back to his apartment. Looking at photos of Jon on a shelf she asks “when” the pictures will be taken. He answers: “In 15-20 years.” The photos depict an older, badly aging Jon sliding deeper and deeper into alcoholism. In the space of less than two pages Jason has shown us (and not shown us) how the rest of this person’s life will play out. As we fill in the spaces of the story the full emotional effect of Jon’s sad and sinking existence is revealed. 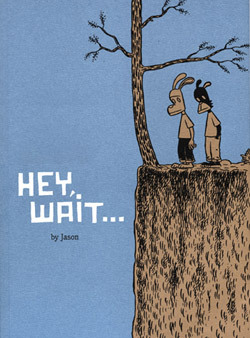 “Hey, Wait…” was first translated and published in America in 2001 to much acclaim from both the comics community as well as the mainstream media. It is a story that is told in a deceptively simple fashion, but also one that will reward multiple readings with it’s not so simple layers of emotional truth.This is definitely a “highest possible recommendation” from me and, well, just about anyone who has ever read it. Jason’s publisher here in the states is Fantagraphics.